Sports footwear for young athletes should fit perfectly so now at Intersport Elverys, our expert staff fit children’s footwear, where we ensure your child gets the right fit AND the right shoe. Everyone’s feet are different so here’s how we get the perfect fit. We start by understanding your child’s activity level, the sports they play and any injuries they may have had. We measure the length of the foot to your longest toe. Next we measure the arch length – that’s the measurement from the heel to the ball joint of the foot. Then we do it all again with the other foot. It’s common for people to have different sized feet so that’s why we always fit for the largest foot. We help you choose the right footwear for your child’s needs. Comfort and support with just the right amount of growing room! The perfect fit in just a few minutes. That’s the Intersport Elverys PERFECT FIT SERVICE. Get your child properly measured for FREE whenever you shop – click HERE to find an Intersport Elverys store near you. 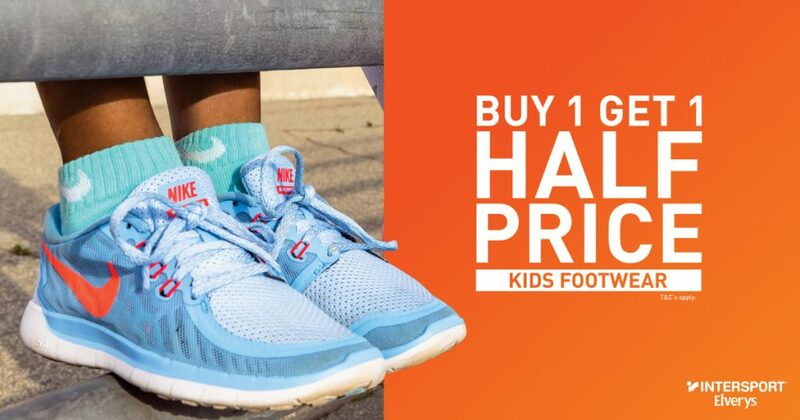 From Weds 21st we have our ‘buy one, get one half price’ on all kids footwear, so you’ll find big savings and the perfect fit only at Intersport Elverys. Our popular ALL STAR OFFERS continue – bringing you the latest for less, from your favourite brands including Nike, adidas, Under Armour and Puma. Click HERE or the banner below to shop!